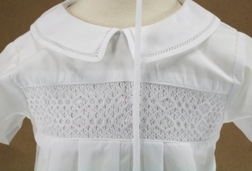 Home > CHRISTENING Gowns-Baptism Outfits for Babies and Children > BOYS > Petit Ami Boy's Smocked Shortall And Matching Hat. Simple, classic and gorgeous! Perfect for for Christening. This is a wonderful white chest smocked shortall for new little boys. The collar and cap are embellished with a sweet openwork entredot.